Our sign channels are designed to mount most types of banners and signs to vertical surfaces such as windows, walls, and partitions. 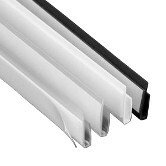 If you need to hang a sign from the overhead, take a look at our Banner Rails and Kits. These sign channels hold material up to .063” thick and mount securely to vertical surfaces with permanent peel-and-stick foam tape. 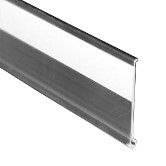 This sign channel is made from extra-clear Provista™ material to keep the channels from detracting from your sign. Use one channel at the top and another at the bottom to securely mount a sign. These sign channels hold material up to 0.060” thick and mount securely to vertical surfaces with permanent peel-and-stick foam tape. Use one channel at the top and another at the bottom to securely mount a sign. Two signs can be mounted, one above the otehr, with the addition of a center channel. These sign channels hold material up to .070” thick and mount securely to vertical surfaces with either permanent, peel-and-stick foam tape, high-tack acrylic film tape, or DK rubber-based film tape. Use one channel at the top and another at the bottom to securely mount a sign. Two signs can be mounted, one above the other, with the addition of a center channel. These sign channels grip material up to 3/32” (0.094 inch) thick and mount securely to vertical surfaces with either permanent, peel-and-stick foam tape or high-tack acrylic film tape. Use one channel at the top and another at the bottom to securely mount a sign. Two signs can be mounted, one above the other, with the addition of a center channel. 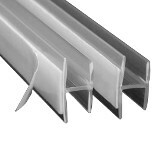 These sign channels hold thick materials, either 1/8” or 1/4” thick. Permanent peel-and-stick foam tape mounts signs securely to vertical surfaces. Use one channel at the top and another at the bottom to securely mount a sign. Two signs can be mounted, one above the other, with the addition of a center channel. These sign channels hold signs up to 0.065” thick and mount securely to vertical surfaces with foam or film tape. This “H” channel works with the 0.060” Sign Channel or the 0.070” Sign Channel to provide a center point when mounting signs directly above and below each other. 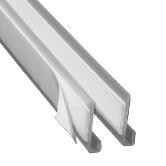 These "H" sign channels hold thick materials, either 1/8” or 1/4” thick. Permanent peel-and-stick foam tape mounts signs securely to vertical surfaces. Use one 1/8” or 1/4” at the top and another at the bottom, with this 1/8” or 1/4” "H" channel in the middle, to securely mount two signs, one above the other. 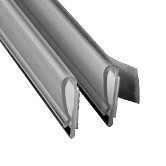 These UPC data rails adhere to shelving with peel-and-stick permanent film tape and create a channel for inserting UPC price strips. 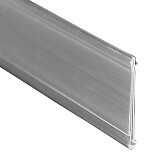 A tall front face protects the inserted strip and a UPC code can be scanned through clear face. These Snap-In UPC data rails snap into standard store shelving without the use of tape. 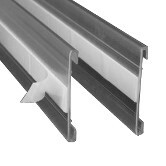 This rail creates a channel for inserting UPC price strips. A tall front face protects the inserted strip and a UPC code can be scanned through clear face. 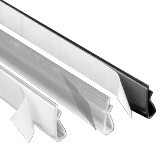 C-Channels adhere to shelving with peel-and-stick permanent foam tape. They create a channel for inserting price and feature strips on shelves that lack a built-in sign channel. 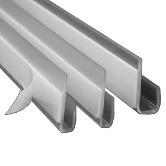 Our 1-1/4” stock size matches standard insert strips. 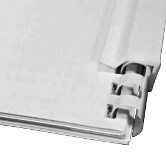 The snap-apart spiral holder is a unique, two-part channel that is designed to hold 3/8 inch Plastic Binding Comb bound booklets. 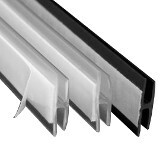 The top and bottom sections snap apart easily for use and adhere to nearly any surface with permanent foam tape. Ideal for flip-chart-style price booklets.